With the arrival of my lost luggage tonight, I can close the book on my 48 hours power trip to Washington on Lufthansa. The verdict is not favourable. As I mentioned previously, the service is ok, but it lacks the certain panache that is required in a truely first class service. Just a few examples: They fill up wine glasses, of which there is only one size btw. 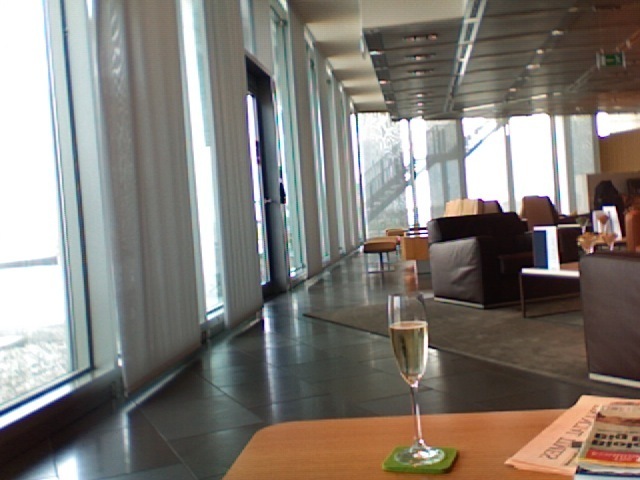 Also, you may get champagne in a wine glass, even though the proper glassware is clearly available. Announcements are annoyingly loud, but the occasional background music is inappropriately muted so that you only get the faint din of the percussion. Not even the nice Van Laack gift polo and track suit will make up for that. But all that is still bearable. Where it gets quite bad is where it really counts. My final connection on the way home was booked rather daringly, so when we run into the inevitable departure delay at Dulles, things became critical. From my earlier experience with Swiss, I expected at least the same level of service when it became apparent that it might just work in the final approach. However - nothing! Not only did I have to ask what was happening (there were only 3 FC passengers) rather than the crew would inform us proäctively. They virtually didn't know anything. Eventually I was told that I was re-booked to a later machine, and that they didn't wait for connections. But nevertheless, I was told to ask the ground personnel, so obviously they weren't sure what was happening. Upon landing, there was no ground personnel at hand, and the transfer desk was helplessly clogged. So I decided to try and make it to the rather distant departure gate on my own devices in order to avoid an unplanned five hours interlude at Frankfurt airport. 'Lo and behold, I was lucky! The gate staff asked jokingly whether I had flown in, so evidently they knew about the delayed connection, and that's how I made it to Basle in time, without much help from Lufthansa - quite on the contrary, in fact. Naturally, my checked luggage only arrived tonight, but that's another story. So, my experience travelling with the crane was well below expectations. I am looking forward to my forthcoming trip to Singapore on Swiss in late August. The trip to London on Tuesday (for three days) will be more of a commuting experience, compared to that. Thanks to a weekend meeting in Washington D.C., I had the opportunity of testing Lufthansa's First Class service today - on a miles upgrade, mind you. 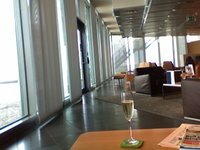 As you can see from the picture, the Frankfurt lounge is really great: stylish, spacious, quiet - everything the discerning traveller looks for. But the key part is the flight, of course. This was the first time I flew on the upper deck of a 747-400. With its 16 seats and the secluded cabin impression, it creates a very clubby atmosphere. There's also a big difference in noise to the usual front seats in single deck planes. So, the travelling experience is very comfortable indeed. The staff was very attentive and friendly, but they weren't quite as smooth as the only other FC experience I've had to date - Swiss. Definitely not up to Swiss standards was the very Haute Cuisine (36000 feet). The fish was slightly overdone, the rest quite uninspired. I've had better. But let's see how they'll perform on the overnight flight back - I'll have the same crew apparently. Oh, and someone send the copilot to an English course! He's obviously able to handle an aircraft, but I am not so sure about polite English. Looking for a suitable folder to hold my corporate accounts 2007 (yes, I know ...), I stumbled across a huge batch of comics that I carefully tore out of the Independent on Sunday back when I was living in Scotland in the early nineties. Considering whether I should scan them or throw them out (which I probably won't anyway), I looked for the stuff online and - bingo! Enjoy Peter Blegvad's Leviathan, an immensely dark humoured, weird & witty set starring a toddler who despairs of the world. Wonderful! Arabs by Mark Allen is a concise (just 142 pages! ), yet comprehensive & respectful portrait of the Arab people. Ostensibly, it is a very difficult task to paint a portrait of a group of people, let alone of an entire nation without falling prey to the temptation satisfying stereotypes. In this case, the deep personal involvement of the author during decades prevented that. The book is structured in ten short chapters: In Search of Arabs - Blood - Religion - Community - Women - The Problem of Power - Politics - Modernity - Language and Signals - Outlook. Most interesting & enlightening are the chapters on Blood, Power, Politics and Language. The latter has been outright intriguing for me - or do you know the optative aorist? Thought so ... well, I am afraid that's about all I can say about the book, because to further summarise it is a futile attempt. The book appears to be quite irreducible. However, I wonder what people more knowledgeable than me about the subject matter think of it. Have you already seen the new iPhone advertisements with which the launch date of 29 June is finally confirmed? One of them promotes the hottest feature in my view, namely Google Maps. This is not new in itself, since it was part of the initial demo, but now the iPhone is advertised with it specifically, so it's for real, not just a feature preview. 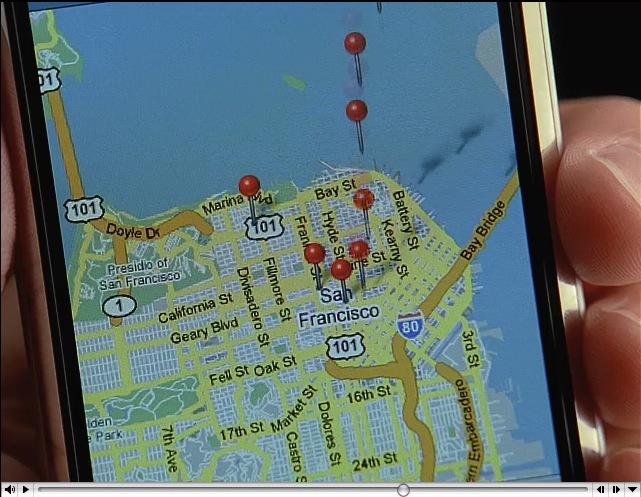 Now the only thing I am wondering about is: Does the iPhone know where it is, and if so, how? The obvious answer is that it has a GPS chip built in, but why hasn't that been mentioned anywhere? Or does it rely on GSM cell triangulation? I hope not, because that method's precision is inferior to GPS and depends on the topology of the network the phone is in just now. Thoughts, anyone?